Another color adaptation is for the fish to assume an overall darker or lighter coloration according to the color of the habitat it occupies. In the illustration to the right, both countershading and overall lightness/darkness color adjustments are illustrated by rainbow trout. In the upper panel, a trout from a southeastern Minnesota stream illustrates a darker dorsal surface comparable to the color of the gravel in the stream below it. 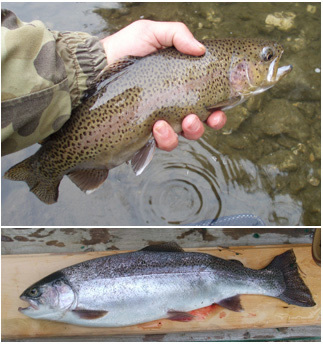 The sides of the trout show the characteristic “rainbow” color stripe and overall dark speckles. Compare this image with the lower panel in which we see a rainbow trout caught from the clear, deeper waters of Lake Huron. Again, the dorsal surface is dark, but with a greenish hue as the water appears when looking down into the lake. The lateral surface of the trout is strongly reflective rather than deeply colored, and the ventral surface (belly) is stark white. The ability to change the lateral surface of the fish to appear much like the surrounding habitat also helps the fish to avoid predation. In this image of a brown trout in our aquarium at the National Trout Center, you can see that the blotchy coloration on the side of the trout has some of the color characteristics of the gravel over which the fish is swimming. Color changes of this kind, from uniform to blotchy, or, from reflective to non-reflective, or, overall dark to light, may take place in a matter of minutes or hours, or, may be related to a life history stage or change in the fish’s behavior over the course of weeks or months. There are many other examples of color adaptation among salmonids, other fishes, and other animals. Natural disguises include transparency that confers a kind of “invisibility” to the fish. This is most frequently seen in larval or juvenile fish. Note that the transparency of the right pectoral fin and the dorsal fin of the aquarium trout make the margins of the fins difficult to discern. The opposite of invisibility is overt mimicry (biologists call this Mullerian mimicry) whereby the fish adopts a distinctive and conspicuous coloration that mimics the colors of a dangerous or unpalatable species. This is uncommon in fishes, but very well illustrated by the coloration of the king snake (harmless species), and the coral snake (deadly poisonous). For an interesting discussion of coloration of fishes, including countershading.